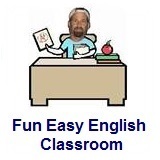 ﻿ Fun Easy English - new classroom free online classes english language lessons speaking listening writing reading april. Hey time to take your pc, iphone, tablet, or whatever, outside and enjoy the sun while studying with Fun Easy English. Grammar this month focuses mainly on pronouns. Pronunciation of English vowels continues. Yup more reductions. 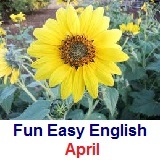 April 1 - April Fool's Day - Test your reading comprehension about April Fool's Day. April 21 - Easter Sunday - Test your reading comprehension about Easter Sunday. April 22 - Earth Day - Test your reading comprehension about Earth Day. April 23 - English Language Day - Test your reading comprehension about English Language Day. April 30 - International Jazz Day - Test your reading comprehension about International Jazz Day.